Car 49 has a built in command center with a full compliment of mobile radios, dry erase board, and map books. Other features include a Whelen light package, Hazmat books, Pre-plan books, accountability board, water rescue equipment, lap top, and misc. hand tools. The present Chiefs vehicle replaced a 2004 Ford Expidition command vehicle. Squirt 49 is equipped with a HALE 2000 GPM pump with a 500 gallon water tank. It is powered by a Cummins 420 HP engine paired with an Allison Transmission. Other features include the 50ft. Snozzel manufactured by Crash Rescue. The boom is capable of flowing 1250 GPM out of the fog nozzle at the tip or 250 GPM out of the piercing tip. The Snozzle also includes a thermal imaging camera which is located at the tip of the boom with a 12inch monitor mounted in the engineers’ compartment. 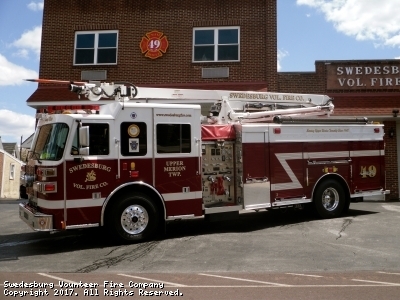 Squirt 49 has a climate controlled cab with seating for 6 firefighters, 8 KW generator, 14 inch chain and K-12 saw, Hurst Maverick combination tool, and a Whelen light package. Along with misc. hand tools and gas powered equipment, Squirt 49 carries 2000ft. of 5” supply hose, 600ft. of 3” hose, 200ft. 2 ½” cross-lay, 200ft of 2 ½” pre-connect to a Blitzfire, 200ft. of 2 ½” dry storage, two 200ft. 1 ¾” cross-lays, 400ft. of 1 ¾” dry storage, and 150ft. of 1” booster line. 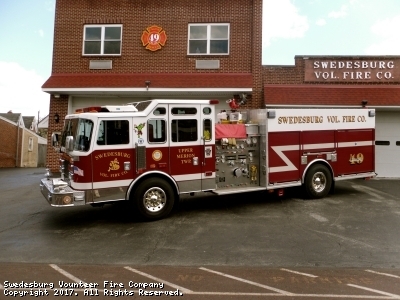 The 2009 Sutphen replaced a 1991 Spartan/E-One pumper. This unit has a climate controlled cab with seating for 6 firefighters and has a 7.5 KW Onan generator. Other special features include a Tomar light package, fire police command center, and a full supply of traffic cones, barricades, and detour signs. 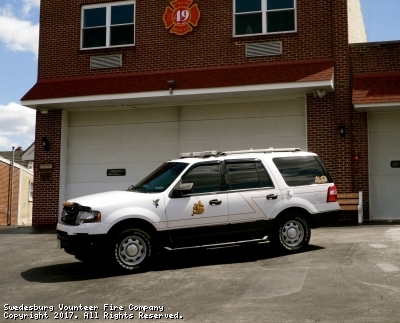 The present fire police truck replaced a 1991 Chevrolet/ Utilimaster fire police unit. Rescue 49 is powered by a Detroit Diesel Series 60 500 HP engine paired with an Allison Transmission. Other features include a climate controlled cab with seating for 8 firefighters, a 75 KW PTO driven generator, a 15 KW Hydraulic driven generator, and has a Tomar light package. Rescue 49 is equipped with a full supply of HURST rescue tools which include a Super ‘X’ Cutter, Maverick tool, 32 inch spreader, (2) 60” rams, (2) 30” rams, and a 20” ram. Along with vehicle rescue equipment the rescue has a full line of water rescue and rope rescue equipment. The generators power two Night Scan light towers with 12 1500 watt quartz lights. Two other features that Rescue 49 has are a Scott revolve air bottle filling station and a Rehab center. The Current rescue truck replaced a 1985 Hahn rescue. 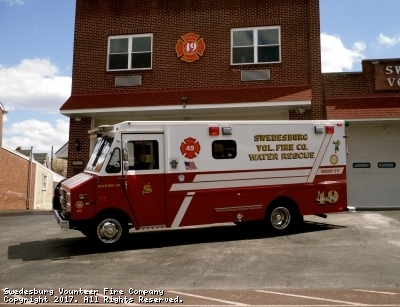 Pipeline 49 is equipped with a HALE 1500 GPM pump with a 750 gallon water tank. It is powered by a Detroit Diesel Series 60 500 HP engine paired with an Allison Transmission. Other features include a climate controlled cab with seating for 10 firefighters, 7.5 KW Onan Generator, 10ton porta power, and a Whelen light package. Along with misc. hand tools and gas powered equipment, Pipeline 49 carries 2400ft. of 5” supply hose, 500ft. of 3” hose, a 200ft. 2 ½” cross-lay, 500ft of 2 ½” dry storage, two 200ft. 1 ¾” cross-lays, 400ft. of 1 ¾” dry storage, and 300ft. of 1” forestry hose. 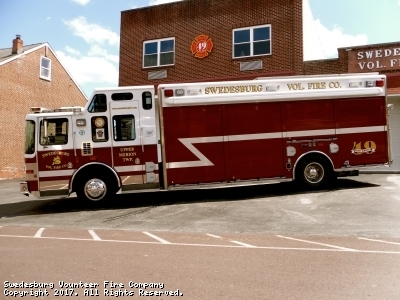 The 1996 KME pumper replaced a 1981 American LaFrance pumper. This unit has seating for 8 water rescue personnel. Marine 49 is fully equipped for any type of water or ice rescue situations. It has over 2000ft. of rope, a line gun, under water camera, dry suits, ice commander suits, PFDs, misc. hand tools, rehab center, command center, and a portable generator. When dispatched for a water rescue the Marine pulls boats 1 and 2. The current marine unit replaced a 1984 Ford/ Horton water rescue unit. 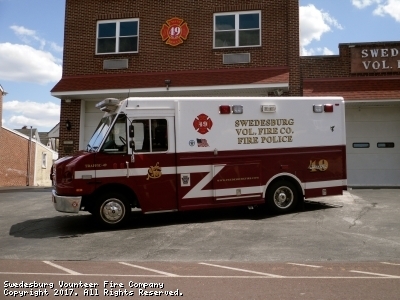 Station 47 King of Prussia Fire Co.
Station 48 Swedeland Fire Co.
Station 27 Norristown Fire Dept. This site has been viewed 34,610 times.